1. Combine 20g butter, onion, garlic and thyme in an 8-cup capacity, heatproof, microwave-safe dish. Cover loosely with paper towel and microwave on HIGH/800 watts (100%) for 2 minutes or until onion is soft. 2. Add rice and stir to coat. Microwave, uncovered, on HIGH (100%) for 1 minute. Stir in 2 cups of stock, cover and microwave on HIGH (100%) for 5 minutes, followed by 7 minutes on MEDIUM (50%). 3. 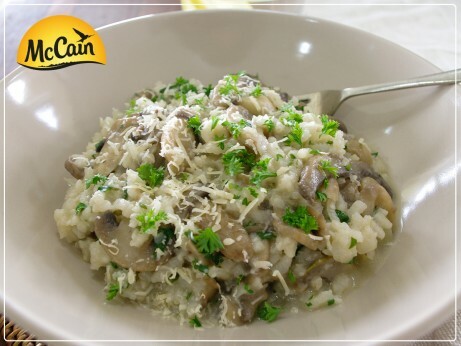 Stir in McCain Sliced Mushrooms, cover and microwave on MEDIUM (50%) for a further 7 minutes. Add ¼ cup of parmesan, ¼ cup of parsley and remaining butter, stir to combine, cover and cook for a further 7 minutes on HIGH (100%). Stir, cover and allow to stand for 5 minutes. 4. Season with salt and pepper to taste. Spoon into bowls, top with remaining parmesan and parsley to serve. 1 Combine 20g butter, onion, garlic and thyme in an 8-cup capacity, heatproof, microwave-safe dish. Cover loosely with paper towel and microwave on HIGH/800 watts (100%) for 2 minutes or until onion is soft. 2 Add rice and stir to coat. Microwave, uncovered, on HIGH (100%) for 1 minute. Stir in 2 cups of stock, cover and microwave on HIGH (100%) for 5 minutes, followed by 7 minutes on MEDIUM (50%). 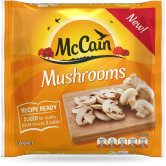 3 Stir in McCain Sliced Mushrooms, cover and microwave on MEDIUM (50%) for a further 7 minutes. Add ¼ cup of parmesan, ¼ cup of parsley and remaining butter, stir to combine, cover and cook for a further 7 minutes on HIGH (100%). Stir, cover and allow to stand for 5 minutes. 4 Season with salt and pepper to taste. Spoon into bowls, top with remaining parmesan and parsley to serve.